India’s permanent representative to the UN in Geneva, Ajit Kumar had reportedly described the UN special rapporteur’s report “a breach of the SR’s mandate”. Rita Izsák-Ndiaye’s report came as a surprise to Government of India: It was released amidst heightened political tension over the suicide of Hyderabad University Dalit research scholar Rohith Vemula. Kumar especially said that the justification of “minority-like characteristics” in SR’s report was not convincing, as it could cover almost every group in society. “There were also reports that teachers refused to correct the homework of Dalit children, refused to provide midday meals to Dalit children, and asked Dalit children to sit separately from children of upper-caste families”, the US report adds. “The law prohibits the employment of scavengers or the construction of dry (nonflush) latrines, and penalties range from imprisonment for up to one year, a fine of 2,000 rupees ($30), or both. Nonetheless, Indian Railways often violated the laws without consequence”, the report points out. There is a living legislation in India namely "Caste Disabilities Removal Act, 1850". This enactment can protect the status of SC to the convert from Hinduism/Buddhism/Sikhism to Christianity/Islam till his life time. The child born to such convert after conversion will not get the SC status. This Act has been ignored completely by concerned authorities implementing the Constitution. Hindu Succession Act, 1956, has provisions in consonance with the above said law to protect rights of succession only to the convert from Hinduism, but not to his descendants. These provision will enable converts to get SC status. USA must uphold International Religious Freedom Act of 1998!Period. India's Secular hypocrisy and American double standard mut end! USA back India for UNSC in spite of Human Rights violation and Social injustice! Christian and Muslim rights are human rights just as Hind and Jews! Woe to evil lawmakers! 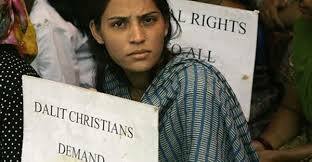 USA must do justice to Native Dalit Christians of India! Social Justice and Freedom of Religion for all!